FANTASTIC Beasts? I Know Where to Find Some! Make no mistake. The new Harry Potter spin-off/prequel movie (a Prequoff? ), Fantastic Beasts and Where to Find Them, is a valiant effort. Directed by David Yates (who helmed the last several Harry Potter entries), and written by J.K. Rowling herself, the film boasts wonderful characters, elaborate set pieces & special effects. The plot is filled with adventure, mystery, and a dash of romance. Without going into too many spoilerish details (which would invoke Avada Kedavra level curses hurled my way), the gist of the story is that British Wizard Newt Scamander (Eddie Redmayne) arrives in 1926 New York City. Once there, the contents of his very special suitcase get loose. The result wreaks havoc on the Big Apple. 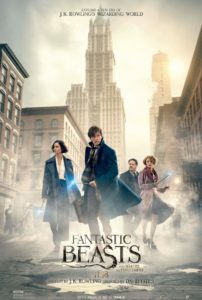 While Newt and his new companions, demoted Auror Tina Goldstein (Katherine Waterston), wannabe baker Jacob Kowalski (Dan Fogler), and Legilimens pro Queenie (Alison Sudol), search for the suitcase escapees, an evil maelstrom, known as an Obscurus, is also on the loose. To complicate things further, our heroes become the targets of the United States’ version of the UK’s Ministry of Magic. Known as the Magical Congress of the United States of America (MACUSA), this governing body is led by President Seraphina Picquery (Carmen Ejogo) and Head Auror Percival Graves (Colin Farrell). In short, much mayhem ensues! Loved the idea behind the Obscurus, a troubled entity that’s created when a young wizard or witch is forced to suppress his or her own true nature. There were definite parallels to the LGBTQIA struggle faced by many children and young adults growing up in hostile environments. My only gripe is that I found my mind WAND-ering several times during the film, as the pacing seemed all over the place, and the plot elements lacked a little cohesion. Minor quibbles aside, the film is enjoyable and delivers a promising start to what is supposed to be a five film series. So grab your buttered popcorn (or butter beer) and strap yourself in for 133 minutes of magic set in the Harry Potter universe. My rating? A solid 5.5 Horcruxes out of 7!